TELEVISION REVIEW: In Plain Sight: Father Goes West – Amnesia for Mary; Truck Trouble for Boston Transplant! Donnie Wahlberg guest-stars in tonight’s season three premiere of In Plain Sight [USA, Wednesdays, 10/9C]: Father Goes West. Wahlberg plays Boston trucker robber Jimmy Porter who runs afoul of his boss when his crew tackles a truck that turns out to have no cargo. Faced with his boss killing his son, he kills the boss and his gunmen and winds up in Albuquerque under the watchful eye of Witsec Marshals Mary Shannon [Mary McCormack] and Marshall Mann [Fred Weller]. HOLLYWOOD INSIDER: Donnie Wahlberg Talks Guest Starring on USA’s Hit Series In Plain Sight! On Friday, I had the pleasure of taking part in a teleconference Q&A session with Donnie Wahlberg in support of his guest-starring role in the third season premiere of USA’s hit series, In Plain Sight [Wednesday, 10/9C]. Wahlberg is an intelligent, articulate fellow who has become a dependable character actor with a wide range. It will come as no surprise that he gives an excellent performance as a single father who has turned over a new leaf – but still has a reservoir of rage toward anyone who threatens his family. HOLLYWOOD INSIDER: In Plain Sight’s Mary McCormack Takes Us Into The World of Marshal Mary Shannon! The second season of In Plain Sight [USA, Sundays, 10/9C] began immediately following the harrowing first season finale and showed us a Mary Shannon who was suffering the after effects of her ordeal. I was part of a teleconference Q&A session with Mary McCormack where she talked about her character’s ordeal, and relationships – and about how Mary does not like change! The Q&A session included the following journalists/bloggers: Jamie Steinberg [Starry Constellation], Jenna Bensoussan [Aced Magazine], Jamie Ruby [Media Blvd. ], Christine Harker [TVOvermind], Beth Ann Henderson [NiceGirlsTV.com], Joel amos [SheKnows.com], Courtney Hedberg [Pass the Remote], and Troy Rogers [thedeadbolt.com]. TELEVISION: In Plain Sight – In the Season Premiere, The Aftermath! 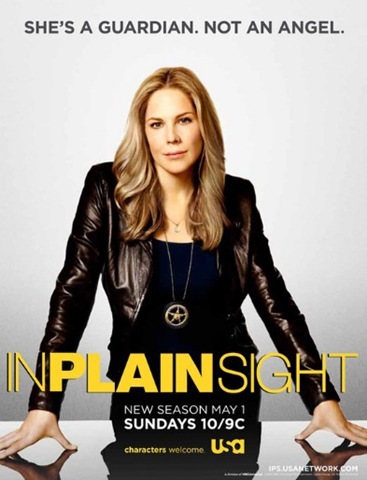 In Plain Sight [USA, Sunday, 10/9C] opens its second season immediately following the events of the first season finale. Marshal Mary Shannon [Mary McCormack] has lived through her kidnapping and, in getting herself free, has killed a man – now, in the season premiere, Mary is on administrative leave pending psychological evaluation [which will happen next week]. That means that when one of her witnesses is murdered, it’s Marshal Marshall [Fred Weller] who has to investigate – though their boss, Stan [the excellent Paul Ben-Victor] allows her to accompany him as an observer. To complicate things, there’s a new assistant, Eleanor [Holly Maples], in the office – and we all know how much Mary likes change. One of the things that makes In Plain Sight unique is the combination of setting [Albuquerque] and milieu [the Federal Witness Protection Program]. It’s also different because its lead character, Mary Shannon is not just a tomboy in her dream job, but a person trying to juggle two-and-a-half families: one composed of her alcoholic ditz of a mother, Jinx [Lesley Ann Warren] and her equally ditzy but now drug-free sister, Brandi [Nicole Hiltz]; the second composed of her colleagues – father-figure Stan and brother Marshall; and the potential for yet another family with Raphael [Christian de la Fuente]. In the premiere, Mary is trying to deal with the previously mentioned murder; getting a witness to stay straight and testify against his cohorts in a pot-growing business, and the mess the FBI left her home in following the events of the first season finale. That’s a lot to deal with, and it’s heightened by Post Traumatic Stress Disorder. If there’s one thing I didn’t expect in the second season premiere, Gilted Lily, it was for Brandi and Jinx to be so tolerable. They constitute the one part of the series that didn’t really work for me. They still exasperate Mary, but they are no longer out of this ditsy – they’ve grown a bit, and promise to grow a lot more over this season. The show still revolves around Mary, though, and even Marshall is glad when he no longer has to be “the boss of her.” The addition of Eleanor to the marshals’ office adds a bit of grit to the one place where Mary really felt at home. Throughout the premiere, the writing is, perhaps, the best it’s been so far. The characters and situations feel right – and the development of Mary’s Post Traumatic Stress is so perfectly twisted that it provides humor and pathos simultaneously. As the supporting cast becomes more interesting, In Plain Sight just continues to get better and better. HOLLYWOOD INSIDER: Roundtable Grills In Plain Sight’s Christian de la Fuente About The New Season! 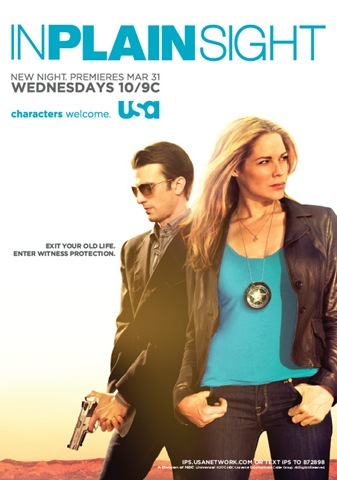 On In Plain Sight [USA, returning Sunday, April 19, 2009, 10/9C] , Mary McCormack’s tough, yet sensitive United Stated Marshall has two families – one, her real [blood] family, that makes her crazy, and the other, her work family, where she feels completely at ease. In between the two, there is Raphael, the Adonis who is her on-again-off-again boyfriend who wants to marry her and start a third family. Christian de la Fuente, who plays Raphael, talked with several internet journalists/bloggers about In Plain Sight’s upcoming second season. Taking part in the conference call were: Jamie Steinberg [Starry Constellation], Jamie Ruby [Media Boulevard], Kristyn Clarke [PopCultureMadness.com], Chelsea Wiley [Sugarslam.com], Christine Harker [TVOvermind.com], Christine Hedberg [Pass the Remote], and Christine Nyholm [Examiner.com].